Last week I boiled up some tang yuan for the 15th day of the Chinese Lunar New Year, otherwise known as the Lantern Festival. I meant to post something about tang yuan, or gooey chewy rice flour balls filled with red bean, black sesame, or peanut paste. But I ducked out the night of the Lantern Festival to attend Amy Chua’s reading and didn’t have time to write about this delicious dessert I first sampled in China many years ago. Tang yuan isn’t very exciting to look at (if you’ve seen one white rice ball, you’ve seen them all), but if you click on this link, you can view them for yourself. 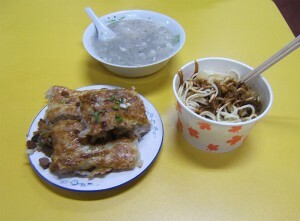 Instead, I’ve posted this photo of two delicious dishes central to Wuhan street food. Well, I have vivid memories eating tang yuan while staying with my former in-laws out in Hubei province. Wuhan was the closest city–albeit two hours away–from their home. On trips into Wuhan, I couldn’t wait to dig into the dish on the right, re gan mian, or hot dry noodles. The hearty noodles are mixed with soy sauce, chopped chives, pickled vegetables, sesame paste, and chili oil. I’ve never found these noodles outside Wuhan. The other dish famous to Wuhan is dou pi, shown on the plate on the left (the bowl in the back looks like a type of rice porridge, or congee). Dou pi is made from a thin bean paste skin, stuffed with sticky rice and minced beef. I once went to a modest restaurant the size of a small gymnasium where the Chairman himself was known to indulge in this local delicacy–even though he once said that revolution is not a dinner party. I dream, dream, dream of eating Wuhan street food again. The breakfasts with re-gan-mian. The tan-yuan with rice wine. The food of my childhood. Sadly I’m stuck in silly old rainy England right now without any of those!